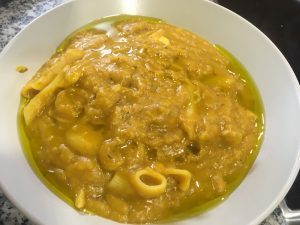 Ragù. 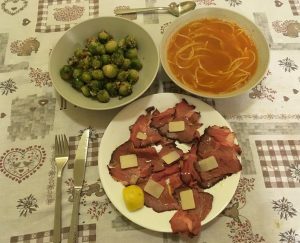 Pride of Emilia-Romagna, the rich, wine-and-broth simmered stuff which is indescribably comforting on a cold, foggy day in the Valpadana. And of course, a testament to its inherent goodness is its bastardization worldwide as “meat sauce” or, in an attempt to put an “authentic” spin on it, “bolognese sauce,” or, even worse, “salsa bolognese,” which is simply wrong since a salsa in Italian is something entirely different. But I don’t begrudge the triers — if I did, I won’t be able to write this post, or eat as well as I have, twice lately. On “Italian nights” the dining facility (DFAC) makes, of course, “meat sauce” — seems like alloro (bay leaf) and erba cipollina (chives) are key ingredients, based off of sight alone (I haven’t tasted it in its “unimproved” form). What I’ve done is ask for a heaping helping of the stuff which I then freeze and re-do in an appropriately Bolognese way. (It’s hard to get fresh ground beef out here.) I’ve been happily surprised both times. 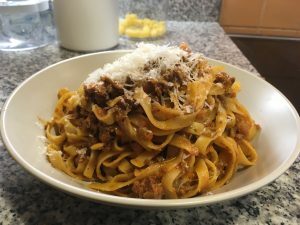 NB: In our household in Italy, we use mamma’s (and hence her mamma’s) time-honored recipe, which is a little different than the classic ragù bolognese, and it’s on that traditional dish that this recipe is based. 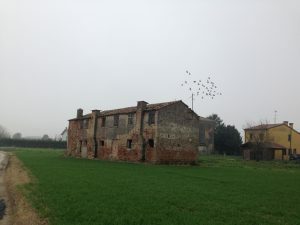 As I said before, Veneto Sud has the advantage of being sometimes like Emilia-Romagna, sometimes like Veneto. Best of both worlds. First, thaw the sub-standard ragù the night before. 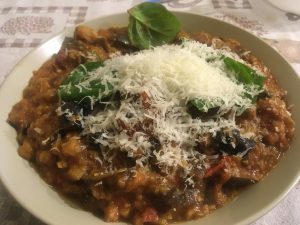 After the vegetables have softened a bit, add the sub-standard ragù. (In a normal recipe one would add the ground beef and/or veal/pork at this point and brown it.) Mix well, careful not to let it burn since it’s already cooked. Add some white wine and let it evaporate. This is crucial. Add nutmeg (Indian stuff, sourced from Amazon — coals-to-Newcastle irony not lost on me) and rosemary. Add a couple cups of beef broth. 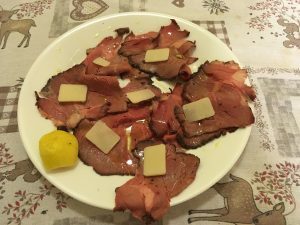 I had pre-fab gelatinous cubes from the Italian PX which I added to boiled water, although I’m expecting some “Better than Bouillon” beef base soon. Turn up the heat a bit (depending on one’s timeframe — I had an afternoon meeting so couldn’t let it simmer for hours) and let the broth boil off. Pay attention to sticking and burning potential. In the meantime, one should be boiling water, salting it liberally, and putting in some tagliatelle which are the only acceptable kind of pasta to eat with this dish. (Unless one is making lasagne, and one could make an exception for real tortellini bolognese, but one should never add southern pasta forms like bucatini and absolutely no spaghetti, please, never, no.) They should be made with egg. They’ll likely be ready in under five minutes. 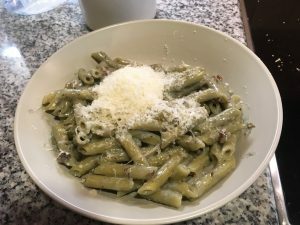 Add more cheese and eccola, one has oneself a meal that at least begins to resemble what’s on Sunday plates all over Emilia-Romagna and Veneto Sud. It might even come close to Trattoria Annamaria on via Belle Arti, one of my favorites spots for cucina bolognese. And thus plain old dining hall “meat sauce” was reborn, made anew and rescued. 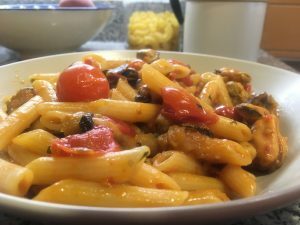 One may note that I didn’t add any extra tomato — the pre-made stuff already had enough, and one characteristic is that real ragú usually has nothing more than a nominal dash of tomato paste. There was a chili cookoff today, and I felt slightly guilty for not going as friends of mine were competing, but I took solace in the fact that ragù is like chili in a couple of ways — beyond both being simmered meat dishes, everyone’s mom has a recipe, and everyone’s mom makes the best version of it. No pancetta, chicken livers, mortadella or other salty meaty additive with the soffritto. Grana instead of whole milk at the end. Thinner passata instead of tomato paste. 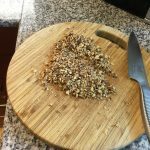 Addition of rosemary and nutmeg, which some people have strong opinions about, but I’ve got used to it and quite like it. It was “Italian night” at the dining facility the other night so I picked up a vat of black olive tapenade, thinking I’d do something with it later, despite the fact that tapenade is a Provençal, not Italian dish, but why not? Surely there is some kind of Mediterranean goodness there to unpack. 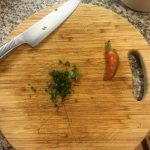 I uncovered a recipe at Giallo Zafferano that somehow had all easily-obtainable ingredients — canned sgombro (mackerel), hot peppers, EVOO, garlic, white wine and parsley. As it ended up, I completely forgot a dash of frozen parsley, but with a bit of lemon zest, it was excellent anyway. 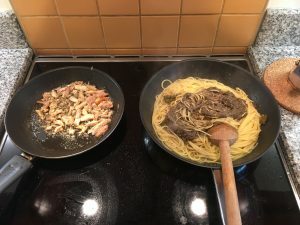 As usual, high-quality Granoro spaghetti, mackerel and EVOO from the Italian PX made this dish better. If you’re dealing with pre-fab tapenade then this dish is even easier. Not Espinaler… but maybe comes close? Put on water for the spaghetti to boil in. When it comes to a boil, liberally salt it. When it re-boils, put in your spaghetti. While this is going on you can prepare the condimento. 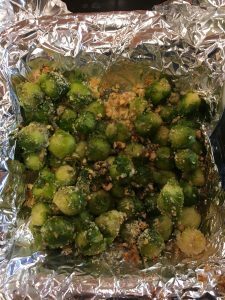 Heat up some EVOO in one pan, toss in a garlic clove. While that’s heating, cube your mackerel. Toss it in once the garlic is browned. (Warning: it will splatter and pop, so adjust the heat accordingly, or pull the pan off the heat when you put in the fish.) Let the mackerel brown. Add salt and black pepper as you like, don’t forget the parsley, and then a dash of wine. Let the wine cook off and then take it off the heat. Use a separate pan to make a soffritto of EVOO and spicy pepper. Giallo Zafferano has a fresh cut one, but I have some pepper spread I made here, so I threw in a teaspoon or two of that. You could probably get away with dried red pepper, too, but those burn very easily, so attenzione. I was tempted to do all this in one pan, but I find that small details in a lot of Italian cookery — especially the simpler dishes — matter a lot. So just resolve yourself to washing more dishes. Use a big pan, too, because you’ll mix your pasta in this. 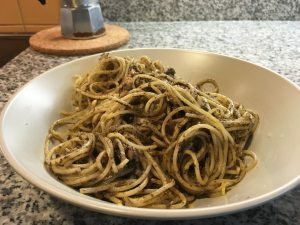 When the pasta is almost done, drain it, toss it in the pepper/EVOO soffritto, mix in the tapenade, and once it’s well-mixed, add your mackerel soffritto. For an extra touch of civility, take out the garlic clove at this point — its work in seasoning your soffritto is done. Mix the whole thing well. At this point you can very finely grate some lemon peel over it. Eccola, there’s your spaghetti con tapenade e sgombro. One word of warning — either lower the heat on the pepper/EVOO pan or work very quickly. You don’t want the pasta to get too dry or fried-seeming. Picturesque landscapes, sunny coasts and the blue sea: these are some of the characteristics of Provence, a land famous not only for its endless lavender fields but also for its centuries-old olive trees. We were inspired by the landscapes of this French province to compose this tasty first course. 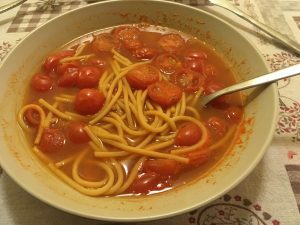 Since I’ve been recovering from a mild illness, or busy, or both, war zone cooking has been limited to soups, which probably deserve their own write up, especially as I’ve been experimenting with way to allungare them, often transforming them into hearty, often porky, and thus wholly un-Italian dishes. 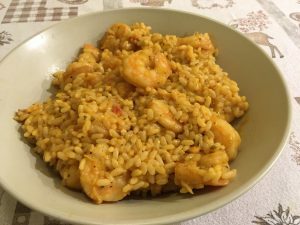 But today’s post features shrimp risotto 1400 km from the nearest port. It is possible, with a couple of major shortcuts. Remember: war zone rules. 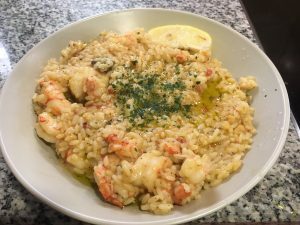 It seems like many versions of pasta with seafood — spaghetti allo scoglio, con le vongole, alle cozze — have made their way to our shores, but seafood risotto, a favorite of the northeast, hasn’t quite caught on. Perhaps because it’s hard to make — one really should use a broth obtained from boiling all the shellfish. But here’s a version that one can make in a war zone, thanks mainly (this time) to the Knorr company. I’ll do better next time. I note that Better than Bouillon does a fish stock on Amazon. 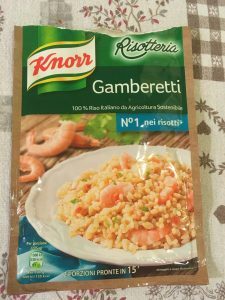 Being sort of an impulse dish, this came mainly from the Knorr “gamberetti” ready-to-eat risotto pack which got my attention at the Italian PX. It’s easy: simply immerse in cold water, bring to a boil, let cook for 15 minutes, and eccolo. That seemed too easy, like cheating. Here’s where it gets creative. I had a pack of my standby Thai frozen shrimp (Italian-branded) in the fridge. It was a foregone conclusion that I’d use them, but just thawing them and throwing them in at the end seemed too boring. So, in a large, flat pan I made a soffritto of a garlic clove and some preserved local green peppers I cooked down before my leave, cooking it on low heat so the oil soaked up all the flavors, threw in the thawed shrimp, and then added a dash of this California chardonnay (suitable only for cooking). The timing was tricky, and I dreaded the shrimp getting rubbery. The risotto wasn’t quite all’onda (a term that I’ve seen in numerous Milanese cooking blogs, but that my thoroughly northern wife claims she’s never heard), so I poured it into the pan with the risotto and let the extra liquid boil off. I added some organic Italian EVOO instead of butter, some frozen Italian parsley and the juice from a fresh lemon wedge. The result was not bad, considering the whole 1400-km-from-the-coast thing. Constant stirring meant I got all the excess liquid off and nothing burned, and the shrimp maintained their texture. I have one more of these Knorr packets — the next one an alla pescatora with shrimp, squid and clam. Since I’m highly dubious about how well those critters can be dehydrated and reconstituted, let’s hope that the PX has one last packet of frozen shrimp. Technically, today’s were more gamberoni. The one I spied in the freeze were certainly gamberini. Stay tuned. **Update — one Italian PX only had some very dubious looking Scottish-origin scampi. There’s still one more option, but it’ll have to wait. Someone leaving post left out some canned organic pumpkin, and having just come from the belpaese, where mighty round and gnarled zucce are at every produce stand, I knew I had to do something with it. Now, my wife’s true cooking talent, I’m convinced, is in her minestrine, zuppe and passate. 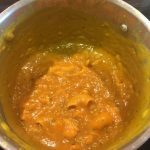 Her version of pumpkin soup is a lot more minimal, but then again, she has access to a level of fresh ingredients that I don’t. But that’s what makes war zone cooking fun. 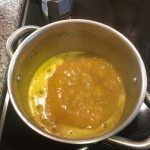 I did some research, reading American recipes (heavily spiced, creamy) and my standby Giallo Zafferano, and combined them using what I had to hand. Now, usually, I am usually all for the minimal Italian way, but again, we play by war zone rules here. I made a soffritto with a finely chopped onion, a garlic clove and some fresh grated ginger (I had bummed fresh ginger off the cafeteria — doctor’s orders for a cold) and the Spanish EVOO. I also added a pat of butter. Once the onions were sweated, I tossed in the brown spices — a dash of curry, bit of cinnamon — stirred, and let that come together. I also put in a tiny bit of salt, probably not necessary with the bouillon. Then the can of pumpkin. I had boiled up a couple of cups of Better than Bouillon (which makes everything better, I’m convinced) while the soffritto came together, and I added about one cup at this point. After it had come together a bit, a dash of paprika (went very easy on this one), some herbs de Provence (I’d prefer just straight rosemary, but I’m hoarding it), a tiny dash of white sugar, and — inspired by one of the American recipes — a tiny drop of maple syrup. (This also compensated for my lack of nutmeg, which I’ve just remedied with an Amazon order.) I added the other half of the bouillon, some water to thin it, and jacked up the heat. It was still a little watery after fifteen minutes, so I added — sparingly — some short pasta, penne and elbows. Again, I’d prefer pastina, tiny little ones, but they’re either too pricey or sold in bulk on Amazon, so I’m making do. As I’d learned watching my wife, they do an admirable job as a thickener, soaking up the excess moisture. Don’t add too much or you just end up with pumpkin pasta. I let it go for about fifteen more minutes then let it cool for about five, adding a dash of black pepper, a liberal amount of parmigiano reggiano and some excellent BioItalia EVOO. It was very tempting to toss in a bit of milk (and due to good luck at the dining hall, we somehow have whole organic milk from Italy), but that’s extremely un-Italian, and it’s easy to see why with the pasta — that’s your thickener, and the grana (grated cheese) is your dairy. There was no need. I was worried I’d over-spiced. This level of tinkering goes beyond my usual impulses, but I think going light on everything helped a lot. So did the cooling. 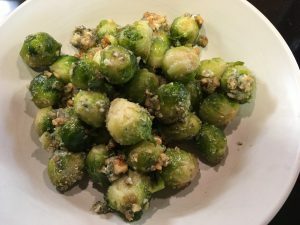 It was excellent, velvety and smooth, agrodolce, filling on a cool fall night, and all it lacked, I think, was some sort of herbed or sage-y pork product on the side — sausage, a cut of loin, an involtino, or perhaps some speck or pancetta. 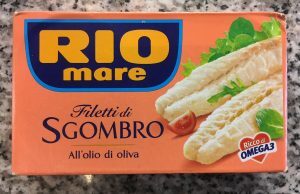 I wished also that I’d had some crusty bread (like pane casareccio) to either fare la scarpetta or make into crostini, but I had to settle for crackers. It wasn’t the minimal version of the stuff we ate in Italy, but a fine addition to the war zone repertoire. Now. If only someone would leave out another can of pumpkin. 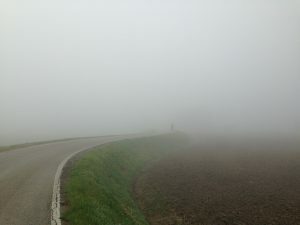 Sono ritornato. War zone cooking is back. I’ve been sick, so a lot of the war zone cookery has been hearty bagged frozen soups, a classic of the diet of the workingman in northern Italy, but really not much to write home about. 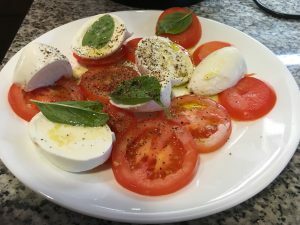 My first couple of non-dining hall, non-frozen soup dishes — a Caprese on a warm afternoon and a pile of pasta pomodoro — were so simple I’m not even going to post recipes but a few keys things made them much better than the norm: excellent EVOO, fresh basil and a surprise tomato find. First off, our dear Italian PXs are getting direly understocked. If it continues, it’ll make this blog a lot more interesting. The silver lining in this is that I’ve spring for the Italia Bio olive oil since it was one of the few left. I also accidentally bought, and then promptly exchanged, something I’d never heard of which is apparently not only vile but also possibly carcinogenic — olive pomace oil. The label, festooned in Italian flags, did get a sucker like me. After reading up on this stuff, I exchanged it for a bottle of passable Spanish EVOO. This was at one of the American PXs. As I mentioned, we have some fresh basil growing at post. I’ve harvest an emergency supply for the coming cold weather, and tried the apparently tried and true method of blanching, drying and freezing it. I’ve long complained about the fresh cherry tomatoes here, which I’ve found not even fit for cooking. But I spied some thick slices of juicy round tomatoes at a sandwich bar, and nabbed them for the Caprese. 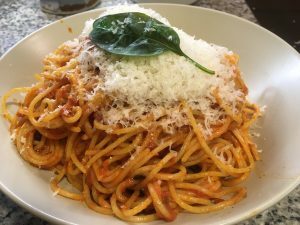 When I first met my wife (a northerner through and through), she told me that she had to have pasta pomodoro every few days, and that sometimes, there’s simply nothing more satisfying. Done right, which good olive oil, good grana, and fresh basil. there’s simply nothing better. My next recipe is less simple, so I’ll leave it at that. This will be the last for a bit, as I’m off to the land of good and accessible food soon enough. I found myself with far too many good fresh vegetables and jarred items the other night, so I improvised a caponata. There are a lot of regional variations, but this is the warzone version here. 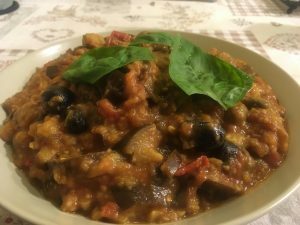 Soffritto of garlic, two non-fiery long peppers and EVOO in a high-walled pot as I cubed and sliced 5-6 eggplants, most medium, one giant. I added the eggplants gradually and, since they’re sponges, added a bit more oil each time. Then 5-6 ripe red tomatoes. This all began to cook down well enough and to be sure, I needed the liquid in the pot. I covered, turned down the heat a little, stirred frequently and let come together. I then raided the fridge and decided to get rid of all my green olives (pitted), black olives (not pitted, but much tastier and ideal for cooking as they have a rich black flesh that falls apart) and capers (all jarred Saclà items courtesy of the Italian PX). I also tossed in an anchovy fillet, which immediately melted and just added a salty flavor. Then a bit of unrefined sugar and some balsamic vinegar (BioItalia, amazingly available here). I was on the fence about this, as I think that white vinegar gives it the agrodolce (sweet and sour) taste that makes it so distinctive. The sugar neutralized the bite of the vinegar well enough; it wasn’t as agrodolce as previous versions I’ve made in a better-stocked kitchen, but it did the trick. Continued to cook and stir, then let cool for at least five minutes and topped with fresh basil from the warzone herb garden. It came out better than I expected, to be honest. I had some pecorino so I couldn’t resist grating a bit, which may be sacrilege in Sicily, but as I’ve said I’ve mainly spent time in the north, so someone please let me know if so. It’s meant to go with meat, so the leftover half I had today, nice and chilled, with copious amount of freshly grilled chicken kebabs, was not a bad way to end this time in the ‘zone. My only regret is that I wish I’d pitted the black olives. I’ll be back online with more ideas next month. Till then, arrivederci. With one eggplant from last weeks’ veggie haul left, and some frozen Chilean mussels, I decided to adapt this. The idea of seafood plus eggplant is clearly a southern one, but one I’m starting to appreciate more. Started by slicing and salting the eggplants early this morning while I did other routine chores. The moisture came out nicely and I washed off the salt and resulting brown liquid and patted dry with paper towels. Those went in a large pan with EVOO and a garlic clove, and soaked up the oil nicely. 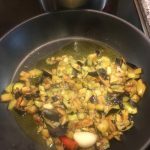 (One recipe I reviewed called for a deep-fry of the eggplant in peanut oil. Someone gave me some truffle oil which uses a sunflower oil base, and I thought about using it as it has a higher smoke point, but thought it was would be a waste. However, let the record show that I think truffle oil is a gimmick. One should eat truffles, and use good olive oil to dress things. There’s no excuse for inferior flavored oil.) 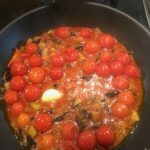 After they absorbed a good amount of oil, I tossed in a can of these Victoria cherry tomatoes, which seem to add magic to everything. I had some assorted fresh local peppers, so decided to use a tiny portion of a red one instead of the good dried ones I obtained from Amazon. I obtained some fresh basil from the war zone herb garden and chopped it finely. Meanwhile, I put the mussels to thaw in some lukewarm water and put on the pasta water to boil. From there on, it was just a matter of timing. When the pasta was almost done, I tossed in the mussels for about two minutes, along with the juice left by the thawing. 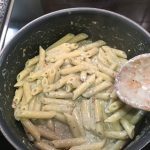 I drained the pasta a good minute before the packet instructed (9 minutes for penne, so 8), threw a little water into the condimento, and then mixed the penne in, turning the heat up a bit to cook down the liquid. The basil went at the end. Like the shrimp dish before it, this one came together fabulously. It probably should have been two plates… but golosamente, it turned into just one. Ah well, it’s the day off here, and I never have pasta for lunch on work days. I go on leave in a week, so probably just a couple more recipes and then it’ll be radio silence for a bit.